Despite a well-received appearance at the 1969 Ann Arbor Blues Festival, and several national tours, which eventually led to his signing with Motown Records in 1972, by the mid ’70s Luther Allison was frustrated with the machinations of the recording world, as well as the general decline in the popularity of the blues in the U.S. Allison decided to relocate to France in 1977 after touring Europe several times during the '70s and enjoying the warm reception he received everywhere he played. By relocating overseas, Allison followed in the footsteps of other blues expatriates like Memphis Slim and Eddie Boyd. During his time in Europe, Allison toured endlessly and released no fewer than 10 albums, only a few of which were available in the U.S. at the time. His stage performances, often consisting of three to four hour shows featuring lengthy guitar solos and Allison's tireless showmanship, quickly became legendary. The opening cut, “Bad Love,” is one of Allison’s trademark tunes and shows the influence of B. B. King on Allison’s writing and playing style. I was always surprised that King never covered this tune, but to be honest, Allison’s version is so on the money that any other efforts would definitely fall short (though Allison’s son Bernard made as game an effort as anyone with his cover version, which remains a staple of his live shows). There simply could not have been a more appropriate opening cut than “Bad Love,” and it would have been easy for the rest of the album to not measure up to its opening cut. Thankfully, that was not the case. The funky “I Want To Know,” written by Sugar Pie DeSanto, Ron Badger, and Bob Geddins, keeps things percolating along, with some deft keyboard work by Ernest Williamson and a great guitar break from Allison. Then things heat up again with the autobiographical title cut (Allison trained as a shoe maker and repairman prior to taking up music), which features more scorching fretwork. “Middle of the Road” is not particularly noteworthy as a composition, but Allison’s soloing nearly pulls the song off. Allison’s R&B chops are on full display for a stylish cover of Mosley & Johnson’s “She Was Born That Way,” and he gives another bravura vocal performance on the low-key “Gave It All.” “You Been Teasin’ Me” is a loose, funky arrangement with a few soaring guitar licks thrown in for good measure, and “Nobody But You” gives Allison an opportunity to show his slide guitar prowess, an underrated facet of his guitar work. “Put Your Money Where Your Mouth Is” features more tantalizing keyboard from Williamson, and segues into one of the album’s most surprising tracks, a stunning cover of “The Things I Used To Do.” Allison, accompanied only by Williamson’s churchy organ, recreates the Guitar Slim classic into a vocal tour de force of regret and hope. The suggestive “Love String,” another Mosley/Johnson composition, gets the full R&B treatment complete with female back-up singers and the Memphis Horns (who appear on several other tracks, including “Bad Love”). Had Allison never picked up a guitar, it would have been easy to see him hitting it big as a soul singer. The closing track, “Freedom,” is a change of pace for Allison. Featuring African rhythm instruments and Another Blessed Creation Choir, it’s a song about the plight of oppressed people throughout the world and how everyone deserves the right to be free. Though the South African references were a bit dated by the time of the album’s release, it’s still a poignant track and still timely in many ways. Backing Allison on the disc was the James Solberg Band, with Solberg providing reliable backing on rhythm guitar, along with Williamson on keyboards and the powerful rhythm section of Dave Smith (bass) and James Robinson (drums). The always dependable Jim Gaines served as producer. 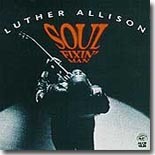 Soul Fixin’ Man was a ground-breaking release for Allison. He carried home a box load of Handy Awards in 1995 and was able to tour non-stop for the next few years, this time in the U.S. as well as Europe, building a huge following of loyal fans, and finally gaining some hard-earned recognition as one of the premier blues artists of his time. He was also able to release two more studio albums for Alligator, both earning their share of Handy's as well. Sadly, just after the release of his third Alligator album, Reckless, Allison fell ill and was diagnosed with lung cancer in July during his 1997 tour and died just a month later, just a few days before his 58th birthday. At least he was able to experience success in his own country before his death. Fortunately for blues fans, Luther Allison left a remarkable legacy of recordings, including most of his European releases now made available in the U.S., thanks to Ruf Records, DVDs of his unbelievable performances, and most importantly, his son Bernard Allison, who has made his own mark as a first-rate blues guitarist. If you have not experienced Luther Allison, Soul Fixin’ Man is the place to start.